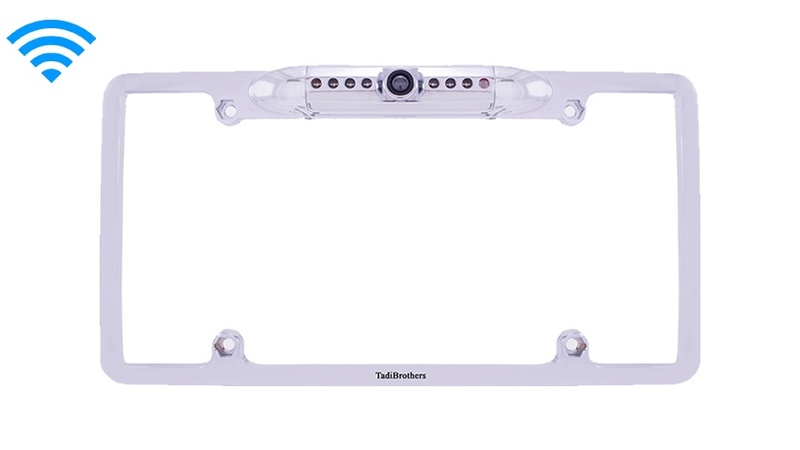 This White License Plate Backup Camera frame is wireless up to 70ft it includes 120-degree viewable angle and is upgradable to 170 degrees. The lens on the backup camera is CCD, which is the high definition version of the backup camera. When we go to tradeshows and we place the CCD next to any standard definition camera, people will always pay the extra fee to have what you get in this camera. We have also built in to the camera military grade night vision with progressive auto night vision. The auto night vision, will activate in a progressive way so that the darker it gets outside the more night vision you will use. This camera is also wireless and will broadcast flawlessly up to 70ft, in any environment. It is very easy to install, you simply connect the camera side to the 12 volts and the corresponding receiver to any monitor. What separates this camera from our other license plate cameras is that it’s made from our proprietary white coating. Not only does it look good but it also guarantees a long life for your camera. At TadiBrothers, our wireless license plate backup camera with an HD color lens is made from rugged steel so you know that it will last. This sleek white high resolution backup camera also comes fully equipped with military-grade night vision, a high-definition CCD color lens, and reversed (mirror) imaging. You can even choose to set it to turn on when you are backing up, or just leave it on while you are driving. You have plenty of vision on both sides of the vehicle and the rear thanks to the wide 120° range. The adjustable brackets mean that you can set the camera in the perfect angle to fit any size vehicle.